What can you say (or not say) about one of the most popular bands of the last 30 years. With a back-catalogue that includes worldwide hits such as Rio, Planet Earth, The Reflex, Girls on Film and even a James Bond theme song – their music defined a generation. Having recently returned to the studio with Mark Ronson to record the album All you need is Now a back to basics approach has seen the band re-capture their own zeitgeist with a collection of classic Duran Duran songs. We are both honoured and more than a little excited to have the band perform at the next Electronic Beats Classics event, and after an unexpected set back when lead singer Simon Le Bon fell ill with laryngitis, we are very pleased that Berlin is now going to be the band’s first step on their European tour. In this first part of a two part interview, I caught up with Nick Rhodes and John Taylor to find how they are feeling about getting back on stage and how they me with their new producer. Hello both – so this is now your first show of the European tour. Nick Rhodes – Yes, indeed. Well we had a few little set backs. The trouble is that when something like that happens with a singer’s throat or voice you are never quite sure when it’s going to be fine to go. So yeah, we have just been waiting. Do you have anything special planned as it is the first show? NR -We have been looking forward to this for a while, and now we are filming it as well. We always feel very comfortable with an electronic scene. We see that very much as our roots and what we came out of and actually very specifically German bands like Kraftwerk and Neu were an enormous influence on us right at the very beginning, so to be part of an electronic event make sense to us. We haven’t done a set list yet, but I tend to think we will stick to a lot more of the dance-groove pieces and some of the more electro things we have done. We have a lot of material rehearsed right now so we have a lot to choose from. So will that be a mixture of older and newer material? NR – Yes for sure. Do you still enjoy playing the older music? NR – Yeah, I mean it goes down well with the audience. People like to hear things that they are familiar with. John Taylor – The new material always invigorates the older material. This new stuff particularly is a lot of fun to play live and if we are having fun on stage, then we are having fun playing all of the numbers. Like Nick says there is enough in the catalogue. We go through periods where some songs are just not doing it for us, so we don’t have to play them. So the new material gives you the opportunity to re-contextualize the older stuff? JT -Yes exactly. You are re-curating your entire oeuvre every night – if you want to look at it so pretentiously, but we kind of are! So how did it feel to be back in the studio? 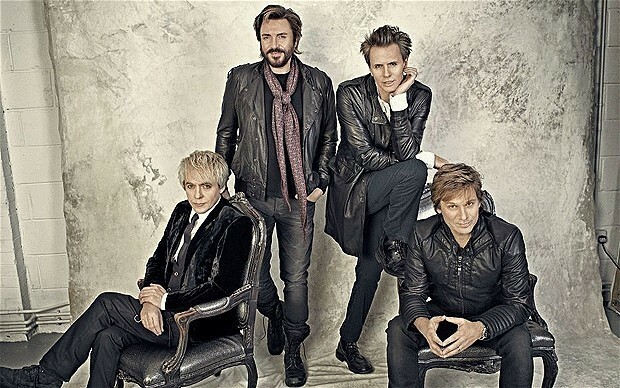 NR – This was a particularly good experience because we worked with Mark Ronson who I think we all concur is the ultimate producer for Duran Duran. He just has all of the right references. He grew up listening to our music and he was a big fan so he knows the history of the catalogue and what we have done and all of these obscure b-sides. He has worked with amazing artists, everyone from Jay Z to the Amy Winehouse album he did as well as a lot of the younger bands. He just has a really strong creative vision and he was able to bring to us a focus that I don’t think we have managed to have on this level for quite a while. And he is an absolute pleasure to have around. He’s funny. A great musician, and has great style and great taste – which is what you want your producer to have. And how did you become introduced to him? JT – Actually it was through an event that Smirnoff put together in Paris. They came up with this concept for an event and the idea was to put DJ’s with bands. The first one they wanted [to do] was putting Mark Ronson together with Duran Duran and when Mark said he was up for it we were up for it…Mark went away and put together four fifteen-minute master mixes, if you like, of his favourite Duran Duran moments. At this point we were both on tour and we first met on stage in Paris where we performed these master mixes. I mean talk about electro! It was kind of a fun dance presentation for us to perform these four fifteen minute segments. We had such a good time doing that with him that we came away thinking, “I wonder if he would be interested in producing us?” We put it to him thinking he may want to do a couple of songs as his reputation was for doing a few tracks – that’s the DJ producer way. After our first writing session with him of two or three days he said “you know I really want to do the whole album” which was thrilling for us. And he was just full of surprises. Most surprising was that he was there at the beginning and he was there at the end. He was the most responsible kind of old school producer. It sounds like he became a de-factor member of the band in this time? NR -Yes, he was involved in some of the song writing.